On two occasions now, a group of students from the MA Art and Science course have visited CERN, engaging in a collaborative relationship with various physicists and engineers that reside there. It appears to be the perfect place to explore how art and science collide. During the first visit, we were introduced to the CERN complex, including the old-school décor, the statue of Lord Shiva, amusing posters and streets named after Nobel Prize winning scientists like ‘Route Marie Curie’ and ‘Route Rutherford’. We were also given a brief history CERN. With regards to the acronym, it stands for ‘Conseil Européen pour la Recherche Nucléaire’ in French or the ‘European Council for Nuclear Research’. It was founded in 1954, as a world-class physics research organization in Europe that aimed to further understanding of what constitutes an atom, hence the word ‘nuclear’. Owing to the negative connotations of this word and because the research now goes further, concerning the constituents of matter (not just atoms) and the forces between them, it now prefers to be known as the ‘European Organisation for Particle Physics’. In terms of location, the CERN complex sits between the Franco-Swiss border near Geneva. It has 22 member states and over 11500 scientific users. The physicists and engineers at CERN are probing the fundamental structure of the universe, by studying basic particles, ‘protons’, which are made to collide together at close to the speed of light to provide clues about how they interact and what the outcome may be. The instruments that do this are ‘accelerators’, which boost beams of particles to high energies before they collide with each other, and ‘detectors’, which observe and record the results of these collisions. 3. to train the scientists and engineers of tomorrow. The slogan is ‘Science for Peace’. Further to this, the 3 main questions the work at CERN aims to answer are those that humanity has been asking since its conception, as expressed in Paul Gauguin’s renowned painting, “Where do we come from? What are we? Where are we going?”. We visited the site of the first hadron collider in the 1960’s. It was fascinating to see their raw materials, including a typewriter and chalk board, highlighting the magnitude of their invention. Moreover, our guide also directed us through an important corridor – where the World Wide Web was first developed by Tim Berners-Lee and his group in 1991. One of the days, we crossed the border into France to visit the much-anticipated CMS or ‘Compact Muon Solenoid’ particle detector. We found out that it was a huge challenge to set up, taking six and a half years, finishing in February 2005. CMS itself is like a cylindrical onion built around the beam pipe, cut up into 15 slices (2000 tonnes each); these were assembled and tested above the surface, then lowered 100m underground. To see the colossal experiment therefore, we took an elevator, 100m underground. Before we entered the main cavern, we noticed a curious entity; it looked like a floor mat, however it was white, and footprints could vividly be seen on it. Michael Hoch, an artist at CERN explained that is was an art experiment, involving white sticky paper, therefore footprints would inevitably stain. It was an expression of how the many people that visit CMS, each with their unique footprint, can be compared to the unique results of each proton collision. When we got into the CMS cavern, the scale and intricacy of the detector was astounding – beautiful on both technical and aesthetic levels. We also experienced the AMS ‘Alpha Magnetic Spectrometer’ control centre. This involves a particle detector, looking for dark matter, antimatter and missing matter from a module on the International Space Station. A memorable part was a talk from Dr Piotr Traczyk, a physicist at CERN, about how it is possible to detect a new particle using Einstein’s theory about energy. He used the Higgs Boson discovery as the example, explaining that there are 4 steps involved: creation, decay, detection and analysis. 1. After the collision of the protons in the LHC, a new particle, the ‘Higgs Boson’ was created, with a mass 120 x that of one proton. 4. From analysing the data, concerning the measure of product decay on a graph, it was clear that there was an uneven distribution, leading to the discovery of the Higgs Boson. Another day, we visited LEAR or the ‘Low Energy Antiproton Ring’, which built in 1982 and operated until 1996. This cooled and decelerated protons for use in experiments. It was then converted into the Low Energy Ion Ring (LEIR), which now provides lead-ion injection for the Large Hadron Collider (LHC). It was interesting to see the old machinery and how instead of being destroyed, it has been updated to suit the current technology. 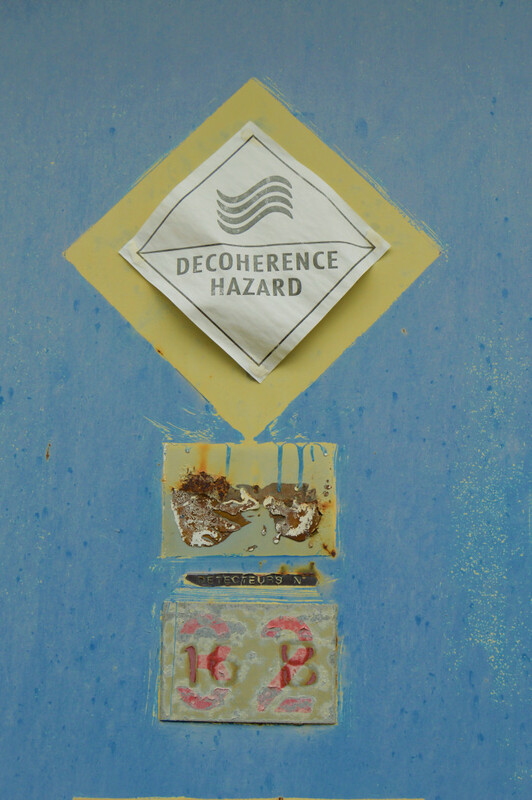 Our guide told us about a particularly interesting old art experiment, which you can still see remnants of; an artist decided to make up random names like Decoherence hazard’ and stick signs up around the complex. Apparently, most of these were never questioned! One afternoon, we took part in a ‘cloud chamber’ workshop. We found out that a cloud chamber is a particle detector used for detecting ionizing radiation. It involves a sealed environment containing a supersaturated water or alcohol vapour. The fluid becomes ionized when a charged particle (for example, an alpha or beta particle) interacts with the mixture. A mist typically forms as the resulting ions act as condensation nuclei and a trail is left behind from charged particles. The tracks have distinctive shapes; for example, an alpha particle creates a broad, straight trail and an electron creates a thin, curved trail. Furthermore, if a uniform magnetic field is applied across the chamber, positively and negatively charged particles will curve in opposite directions. We put some dry ice in an insulating container; covered this with a mat; poured isopropyl alcohol around the mat and sealed this with a large lid that had a sponge attached to the top. After turning the lights off, and using a flashlight to view the experiment, we noticed the beautiful trails created by the charged particles. Naturally, as artists, we were drawn to art and quickly located the two exhibition spaces at CERN, ‘the Globe’ and ‘Microcosm’. Adjacent to the Globe, there was a fascinating metal sculpture that looked like a scroll unravelling from afar. As you got closer, it became clear that there were numbers, figures and characters etched into it. On one side, there were dates, equations and diagrams of historical and modern-day scientific discoveries and innovations, including the standard model equation and particles, as well as the periodic table elements and the masses. On the other side of this edifice were the names of the scientists involved in these discoveries…a beautiful artistic tribute to science and furthering knowledge. Inside the Globe were interactive games, videos and chair pods fitted with sound installations explaining the work being done at CERN. Microcosm, similarly illustrated the processes involved in colliding and detecting protons, as well as other endeavours like the CLOUD experiment. It also involved a life size sculpture of CMS, which we exploited for group photo purposes. On the last day, we visited the ‘IDEASquare’. This is a test facility at CERN that hosts detector research and development projects, bringing together physicists, visiting students and external project collaborators to generate new ideas and work on conceptual prototypes. It promotes engagement in a collective space. It was described by Markus Nordberg, who gave us a talk about it, as an experiment to explore whether innovation can be delivered at a marginal cost, as the activities are not covered by the CERN budget. Lastly, we had a talk by Professor John Ellis, a theoretical physicist based at King’s College London and CERN. He highlighted the need for creativity in his field in order to be able to develop new and potentially absurd theories about the universe. He suggested that the notion of polarised light in the sky has been mapped beautifully and vividly resembles Van Gogh’s sky in ‘Starry Night’. It seems from examples such as this, that there must be an intrinsic link between creativity and innovation. His mutual appreciation of art and science pleasantly summed up the first trip. The second trip involved specific trips and workshops organised by the students. A highlight includes a visit to the CLOUD or ‘Cosmics Leaving Outdoor Droplets’ experiment at CERN. This involves an advanced cloud chamber to study the possible link between galactic cosmic rays (charged particles from outer space), biogenic vapours from trees and cloud formation. It is suggested that cosmic rays may influence cloud cover either through the formation of new aerosols (tiny particles suspended in the air that can grow to form seeds for cloud droplets). Tiny changes in the clouds can affect the Earth’s climate, therefore learning about how they develop is important. We also had the chance to visit an extremely sterile zone where silicon sheets are created; these are subsequently fitted to the particle accelerators. Overall, the visits have been enlightening and inspiring. We plan to host an exhibition in the next few months exploring our collaborative experiences with CERN. Copyright © 2018 Priya Odedra. All rights reserved.